I have seen some guys treat their nails here, but I guess this typically is a girls kind of place. That is why I will say: “My lovely wife forced me to suggest this spot”. But honestly, being a man and all, I think she is right! 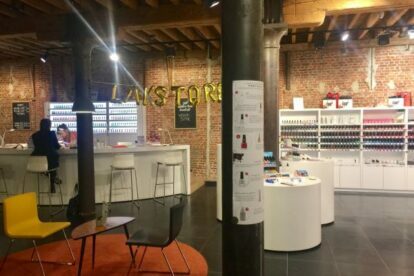 The first time I visited LAKstore, I was buying my wife a selection of nail polish for Christmas. She loves the brand OPI and I remembered here saying that LAKstore has a good selection. That was a lie, because I don’t think they have been selecting at all. 🙂 Their collection of nail polish is HUGE! Luckily I got some great advice making her very happy in the end. The shopping does not stop with choosing a nail polish either. They also offer manicures, pedicures and workshops. There is even a manicure for kids called ‘Tuttefrut’ (which means ‘Bubblegum’). Getting her nails done like mummy? My daughter loves it! If you want to spoil yourself even more (or if you are waiting until your wife and kids are done like me), drink a cocktail while you are treated. Offline Antwerp tips? Get our iPhone / Android app!